Swedish government institution Länsstyrelsen has recently threatened fitness24seven with consequences for having surveillance cameras in their gym. What Länsstyrelsen don’t understand is that they are doing more damage than good. First of all fitness24seven is a club which requires a membership and a pass card, it is NOT a public place and therefor the video surveillance law does NOT apply here. The members of fitness24seven all sign a membership agreement document where we among many things agree to the fact that there are video surveillance cameras in the gym. This is required since it’s an un-manned 24-hour gym and the cameras are there for the member’s safety! I have never ever heard any fitness24seven member complain about the cameras. 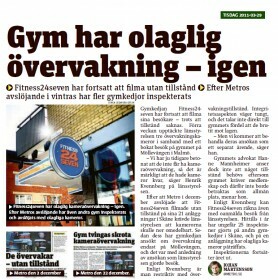 Furthermore Länsstyrelsen are hurting a perfectly good Swedish business by their complaints towards fitness24seven. Let’s assume the worst case scenario where Länsstyrelsen shut down fitness24seven because of this, what will happen then? To start with it will generate around 100 more unemployed people which fitness24seven today supply with work. It will also destroy the wellness and fitness for thousands of members and possibly make some of them never go to the gym again because of distance or costs of getting a new gym. Many of the fitness24seven members come there for health reasons, and if they do not have fitness24seven they will over time most likely become more unhealthy and possibly cost the government more money in health care costs because of overweight related diseases. So Länsstyrelsen, please think CAREFULLY and don’t make a fool out of yourselves.